Every day we dived three to four sites to sample the view of Komodo underwater. Cold, current swept pinnacles allowed a bit of wide angle and even a visit from mantas at Manta Alley, but were mostly macro dives. 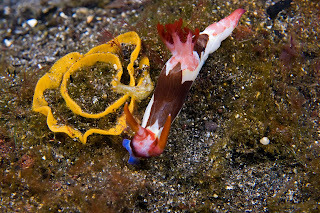 I saw two brightly colored Rhinopios, a myriad of nudigranchs laying eggs, fire urchins and sea snakes. The warmer northern muck dives near Moyo Island were a pleasant change for the chilly ones at Cannibal Rock. The top of the hill at the preserve afforded a hazy panoramic view of the bay and sparsely covered hills with eagles and cockatoos flying by squawking. The harbor water was dotted with boats and twinkled under the morning sun . We stopped for a group photo and began our descent to the beach. Back at the village I collected some souvenirs at the covered market area where one can find dragon carvings and all sorts of trinkets and local pearls. Over the next few days we sailed south to Rinja and Horseshoe Bay. On Rinja Island we went ashore for brief encounter with more dragons who roamed the beach unrestricted by a park environment. 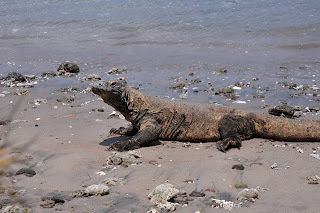 These animals are more aggressive and curious than those at Loh Liang on Komodo . We made a wet landing in the panga and scurried up above the sand to a slight embankment, armed with tree branches as the dragons approached to check out the latest visitors. One dragon took off and chased a diver in our group, but he was stopped by a couple of large sticks planted in his path. A large can of tuna was proffered to distract the dragons, and we headed back to our boat. The crew headed to Rija a few times after the end of the dive day to play soccer on the beach, and the dragons approached and watched from closeby, doubtless fascinated by the humans darting about kicking a round object across the sand. 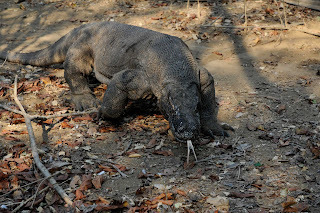 Our group made an early morning visit to the park to observe the famous Komodo Dragons up close. As we reached the landing pier around 7:30AM, the island was already teeming with tour groups. The heat and humidity were already cloying and intense.The visitor center is well organized with guides, maps and story boards of facts about the island and its wildlife.We were given excellent reference materials and information pamphlets that helped us get the most out of our brief time ashore. We encountered a pair of dragons almost immediately on the trail. 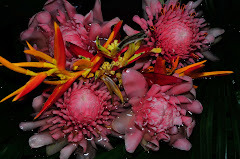 Sometimes they stay hidden from view, although there are deer, wild boar , cockatoos and flowers and other animals to see. A large pair of males engaged in a singularly amusing tussle as they warmed up in the morning sun. When the dragons awake they are almost comatose from the cooler evening air, but then they warm up and move about. They can run up to 15 MPH! One dragon lay outstretched in a small clearing as another male approached from the rear, climbed on top of him and began wriggling and scratching his flanks with long fearsome claws. The crowd of onlookers laughed with amusement, we quickly shot images and moved on along the scanty forest path. Hidden in the trees , a timid deer nibbled grass and leaves. One interesting tree was a cotton tree. From its boughs hung large soft fluffy balls of material that looked like cotton candy.The trail looped around and up a hill ; we trudged along the slippery path in the soaring heat. Every few yards we came across a set of tracks, marked with long, deep grooves from claws...the dragons had been there. 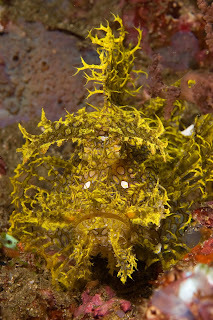 Indonesia is one of my favorite regions of the world for diving and exploring. Its rich diversity above and below water makes it ever mysterious and full of enchanting surprises. Having visited dive sites around the perimeter of the Moluccas "Spice Islands" in Sulawesi,Banda Sea , Raja Ampat and the Lembeh Strait, I joined friends from Brazil to head for Komodo and the Sumba Sea to the east of Bali. After a rendez-vous at the palatial Hotel Intercontinental in Sanur we spent a blissful night by the beach and set out on our journey. Komodo was a total departure from the other areas I had visited in Indonesia. The landscape is barren, brown and arid. The dry rolling hills resemble slumbering dinosaurs that might suddenly awaken and amble down into the placid aquamarine waters. 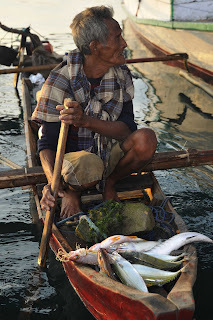 Small colorful fishing boats glide across the sea, back and forth in the bays and straits, the mirror like surface hiding swift currents that flow around the reefs and sandy bottom. Komodo National Park is a World Heritage Site and consists of two main islands: Komodo and Rinja, with a few smaller islets sprinkled in between an to the east and north. We spent our first night in the park area by Pink Sand Beach, its lovely expanse the color of a conch shell's interior. My mask fogging plagued the first two days of diving on macro sites which contained a treasure trove of new species to observe. Crystal Rock was a welcome change for sensational wide angle shooting full of fish and rich yellow soft corals like Onemobaa. We spent time on land surveying Komodo and Flores nearby, and wandered about at the crest of a breezy hilltop overlooking quiet bays on either side. Returning to Mermaid I and swimming off the fan tail was a welcome departure from gearing up and riding out to a dive site in a crowded panga. As I soon discovered this was my last opportunity for days to swim in warm water. As we ventured south the temperature dropped to a chilly 70*F. BRRR! More weight, more neoprene, darker and colder dives.